As an icon of the Southern California region and beyond, Father Joe Carroll has selflessly and tirelessly served our community for more than three decades. Although he retired in 2011 and is no longer associated with Father Joe’s Villages, Father Joe continues to lend a hand in our community with charm and charisma. His efforts in San Diego began in 1982 when Bishop Leo Maher charged him with finding a better option for our community’s homeless and poor. Father likes to say that he tried to politely decline the task, since he knew nothing of the plight of the homeless previous to this assignment, but the Bishop insisted that he was the man for the job. By all accounts, Joe Carroll rose to the occasion. He traveled the country researching homeless service providers and saw nothing that inspired him. 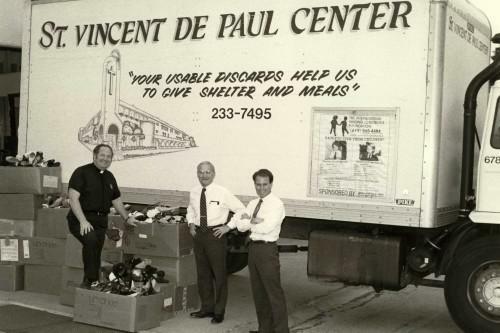 An immensely innovative and resourceful man, Father Joe embarked on creating an entirely new, one-stop approach to homeless treatment and prevention, which later became the hallmark of St. Vincent de Paul Village and Father Joe’s Villages. By 1987 (five years later), his ministry had expanded from handing out peanut butter sandwiches to people on the streets to the opening of a $12 million facility known as the Joan Kroc Center. The first of its kind, this facility became the cornerstone of what is now St. Vincent de Paul Village and contained a transitional housing program that included meals, job training, education, healthcare, therapeutic childcare and more – all under one roof. This innovative, wraparound approach has been replicated across the country and around the world. Father Joe continues to raise his voice on issues related to homelessness throughout the region. While his political opinions and endorsements are his own do not represent those of Father Joe’s Villages as a nonprofit agency, he remains involved in public discussion as a caring individual citizen. Father Joe has been an invaluable asset in keeping our mission close at heart and the spirit on which the organization was founded alive and well. To have such an exemplary model of compassion, respect, empathy, empowerment, and dignity in our community, San Diego has been truly blessed.